The first ICIS Duty and Regulatory Bulletin focuses on developments in the chemicals and fertilizers regulatory space. Released on 12 June, the first bulletin includes insights on spotlight products, along with interviews with lawyers and policymakers, covering the implications of Trump, Brexit, and China’s bid to be recognised as a market economy. The bulletin also provides an insight on shipping trends and freight rates for main trade routes in Europe and globally. Complete your details to view the latest bulletin. 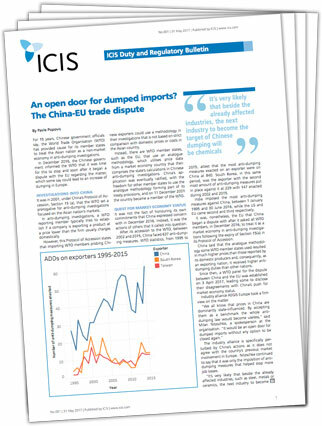 Heidi Finch, Senior Editor at ICIS, discusses market tightness and price pressure, particularly in the European titanium dioxide (TiO2) market. Listen to Heidi’s interview with Markets Reporter Pavle Popovic to see what is driving these market conditions.